However, I have some doubts as to the value of what I have been doing. When I look at the list of things I have got rid of, a lot of it is rubbish which should have been disposed of straight away rather than tucked away somewhere to gather dust. Am I really reducing my possessions or just chucking out rubbish? I think what I need to focus on once this exercise is finished is actually reducing the amount of belongings I have rather than just decluttering. I have sorted through my jewellery boxes today. I have put all the broken chains, odd earrings etc. into an envelope to go into a charity collection at school. I’ve put a couple of things into the charity shop bag and thrown away about 6 jewellers boxes and a broken jewellery box. But I’ve still got about 30 necklaces, not to mention all the pairs of earrings, bracelets etc. I don’t even wear much jewellery. The problem is I don’t know yet which pieces to give away and which to keep. So I’ve just put everything away in an orderly way and I’ll revisit this problem later. I think what I need to do is complete the 30 days and see it as a major clear out of unnecessary clutter. then, when I can see the wood from the trees, take a look at each and every thing I possess and ask myself if I know it to be useful or believe it to be beautiful. If the answer is ‘no’ – pass it on to someone else who will appreciate it. I’m going through the ‘quantity’ at the moment and I need to move on to the ‘quality’. 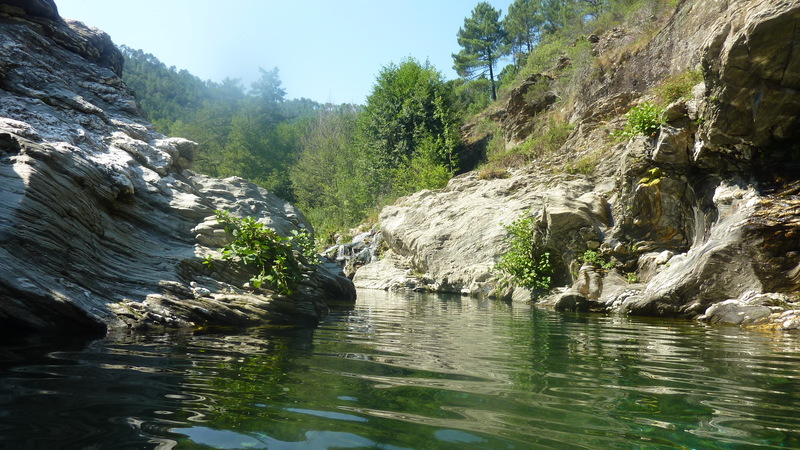 My photo today is a sparkling, clear river in which we swam in the summer of 2012 near St Etienne Vallee Francais in the stunning Cevennes region of France. Categories: Minimalism | Tags: Cevennes, clutter, minimalist life, River swimming, St Etienne Vallee Francais | Permalink.